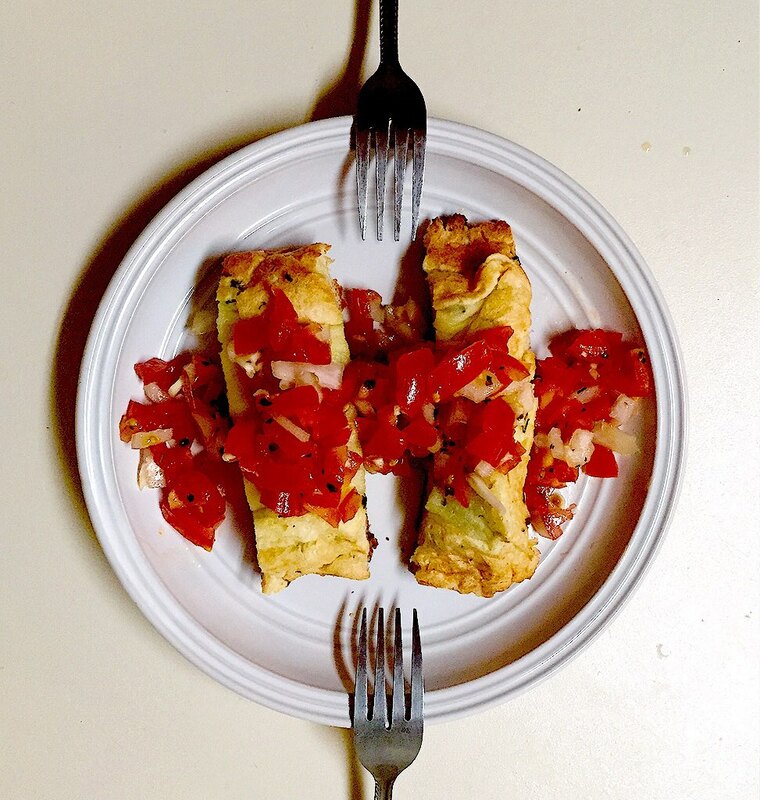 ~ Amateur 'foodie' and cook. I'll try anything once. 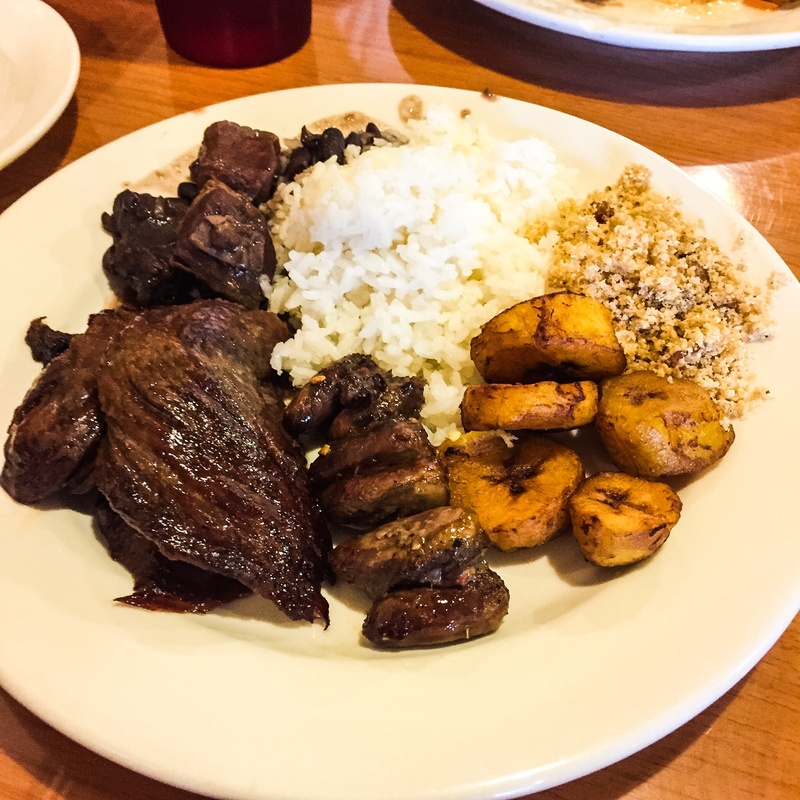 Brazilian Cuisine, North of Atlanta. Call me cliche, but in my happy place, my imagination takes me to Copacabana Beach with “Girl From Ipanema” playing in the background. A beautiful woman walks by with a platter filled with all my favorite Brazilian goodies. Golden brown fried plantains the same color as her sun-kissed skin, the passion fruit mousse as sweet as her smile, and the plump round chocolate brigadeiros complementing her…eyes. But then I wake up. Life isn’t perfect, but food can bring me pretty close to it. So I hop in my car and head over to what I’ve unofficially dubbed “Little Brazil”, the clusters of strip malls between Roswell and Marietta Georgia with the can’t miss green and yellow flags. They’ve got it all: drug stores, beauty salons, convenience stores, butchers, bakeries, and cafés. Realtors, lawyers, and car dealerships all have the signs ‘Se fala português’ (Portuguese spoken here). My first stop is at Brazilian Bakery for my weekly treat, and today’s appetizer: the coxinha. I’ve introduced these delicious snacks to my close friend and photographer, Jordan, who best describes these as ‘chicken dough balls’. Spot on Jordan. Shredded chicken and cheese, wrapped in dough, shaped into a chicken thigh as an homage to its namesake (coxinha in Portuguese means ‘little thigh’) and deep-fried to perfection. Healthy? No, but much like the rest of today’s meal, I’m not worrying about calorie counts; I’m more concerned with how everything tastes. The coxinha alone is delicious, but I love to add a drop or two of hot sauce to give it a little kick. I leave Brazilian Bakery and head to Sabor do Brazil, a buffet and churrascaria (barbecue). Lunch is a busy time with most tables occupied. But unlike Brazilian Bakery, which is mostly a locals/Portuguese-speaking only crowd, Sabor’s patrons are more diverse. The buffet line starts with a salad station and leads into steaming hot pans of rice, a bean and meat stew (feijoada), baked chicken (frango), plantains, and farofa, a cassava flour mixture. But the best part is the churrasqueira at the end of the line, several cuts of meat rotating slowly over an open coal fire. You’d better believe they serve the famous rump cap cut of beef, better known as picanha. 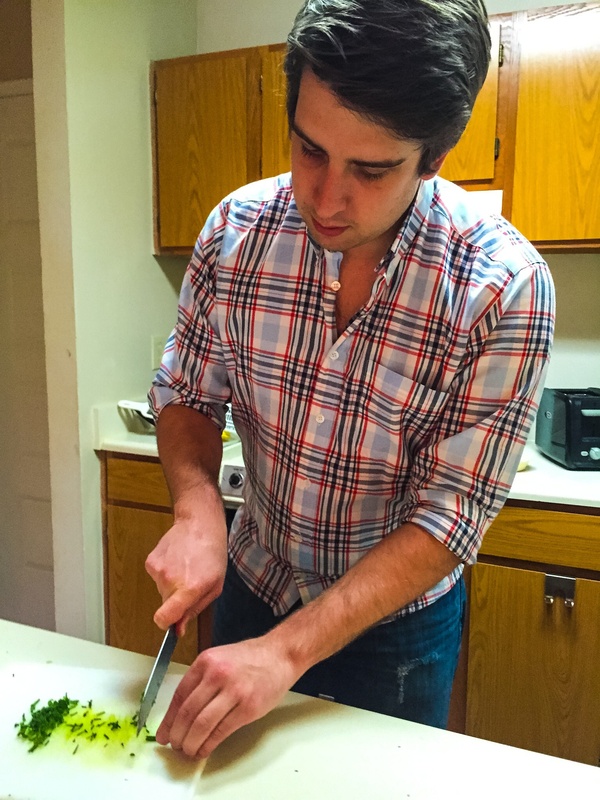 A staff member cuts three thin slices with a half-inch layer of fat on each one. No complaints from me, the juicy fat eaten with the tender medium-rare cut always leaves me wanting more. Instead I opt for a few chicken hearts to satisfy the foodie in me. Top (L-R): Feijoada, Rice, Farofa with Bacon. Farofa with Bacon. Used as an accompaniment with rice or feijoada stew. I also enjoy sprinkling some on my meat for added flavor and a different but tasty texture. 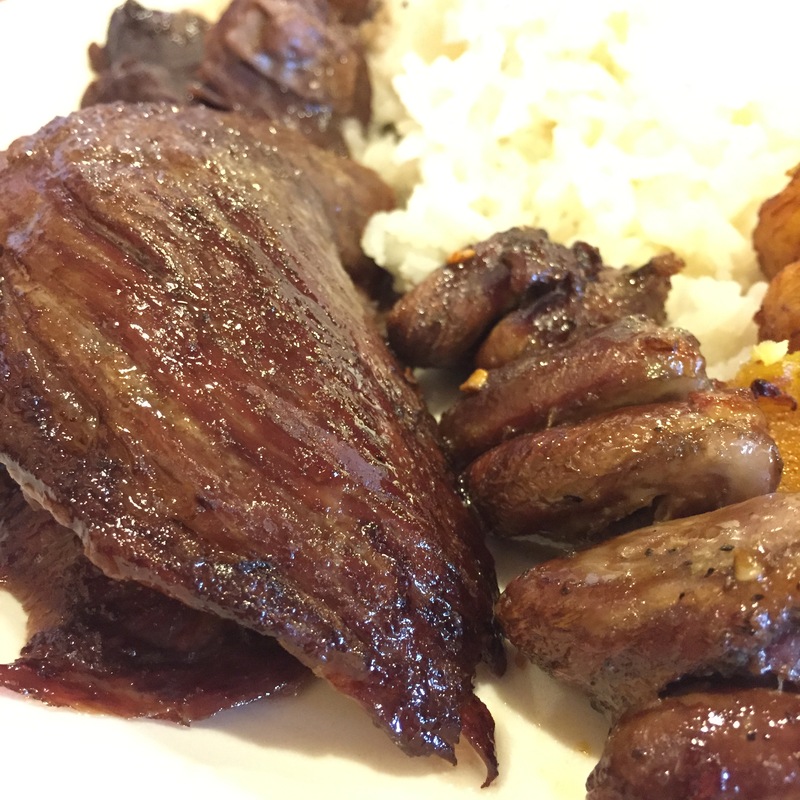 Picanha cut and chicken hearts. Delicioso! It’s easy to overindulge at a Brazilian buffet, but I had to leave room for dessert. And for that I had to go back to Brazilian Bakery. Yes, it’s so good that I sometimes go more than twice a day. You can see me in childlike wonderment, face nearly pressed up against the glass of the bakery displays, drooling over the fresh and homemade baked goods. The temptation to ask for “one of everything” is very strong, but I limit myself to a sampling of the goods that appeared in my aforementioned Copacabana daydream. 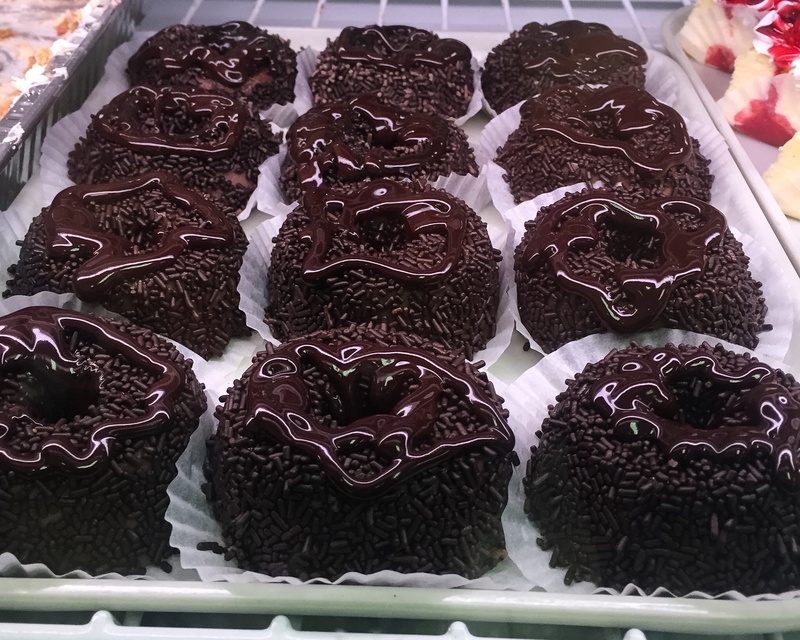 Brigadeiros. Not in the typical ‘rolled ball’ form, but delicious nonetheless. Condensed milk covered chocolate sprinkles with a chocolate drizzle. Brazilians reading this may be shocked to find I haven’t mentioned their beloved cheese bread (pão de queijo). Fret not; I’ve saved the best for last. But I fear I might upset the purists. I’ve taken it upon myself to make my own cheese bread, with a little twist. 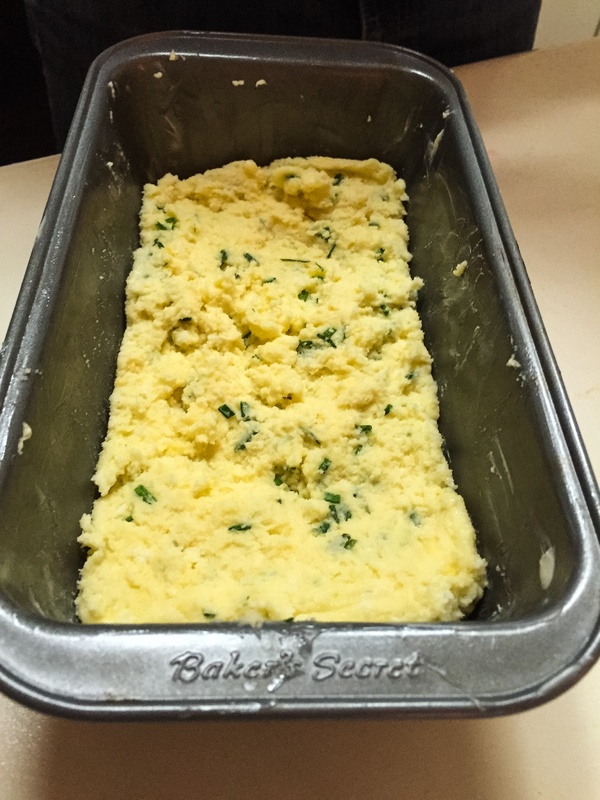 Instead of making bite sized rolls, I decide to put the mixture directly into a baking pan so as to produce one large loaf of cheese bread. 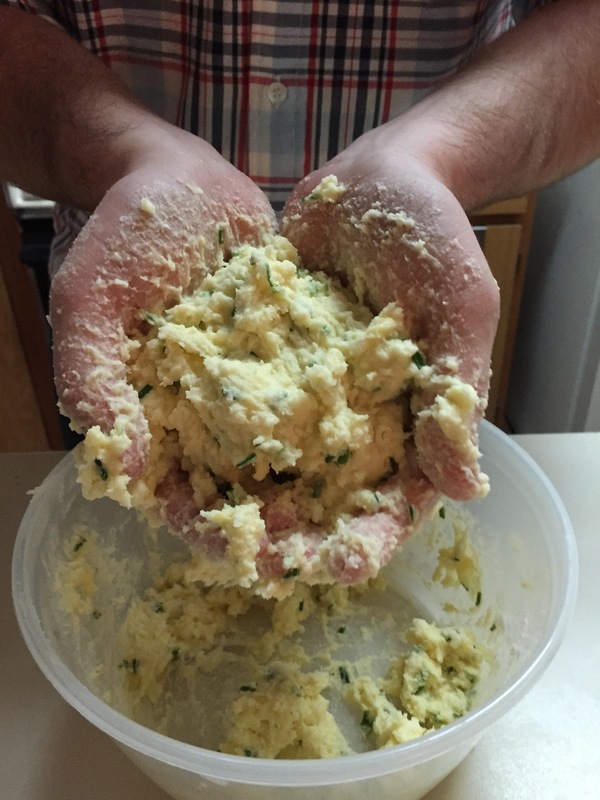 I’ve also added chopped chives to add a little extra flavor. While I wait for the bread to bake, I dice some tomatoes, garlic, and onion, and stir them all together with basil and extra virgin olive oil. I remove the bread from the oven after about 35 minutes, cut two slices, and top them with the tomato mixture. I call it bruschetta brasileira, a nod to my history of working in Italian restaurants. For the sake of my old Italian boss, I ask you, the reader, to pronounce bruschetta correctly: ‘broo-sket-uh’. Ready to enter the oven. The most common method to prepare this is rolling quarter-sized balls of the mixture. I’ve opted for the ‘loaf’ approach. The bread was still soft in the middle, which is common for pão de queijo, but it could have stayed in the oven a bit longer. The chives were an excellent addition, but unfortunately the onions from the tomato topping overpowered their flavor. Overall, it was a valiant effort at a new fusion dish that could stand to see some modifications. 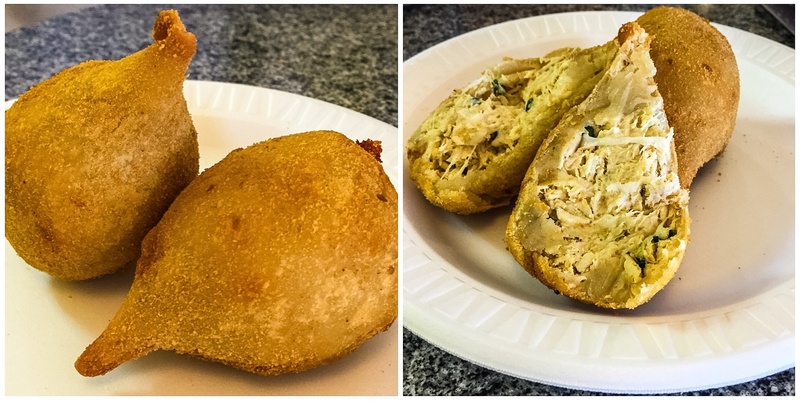 What gives pão de queijo its distinct flavor? The mixture is manioc (also known as cassava) flour based. 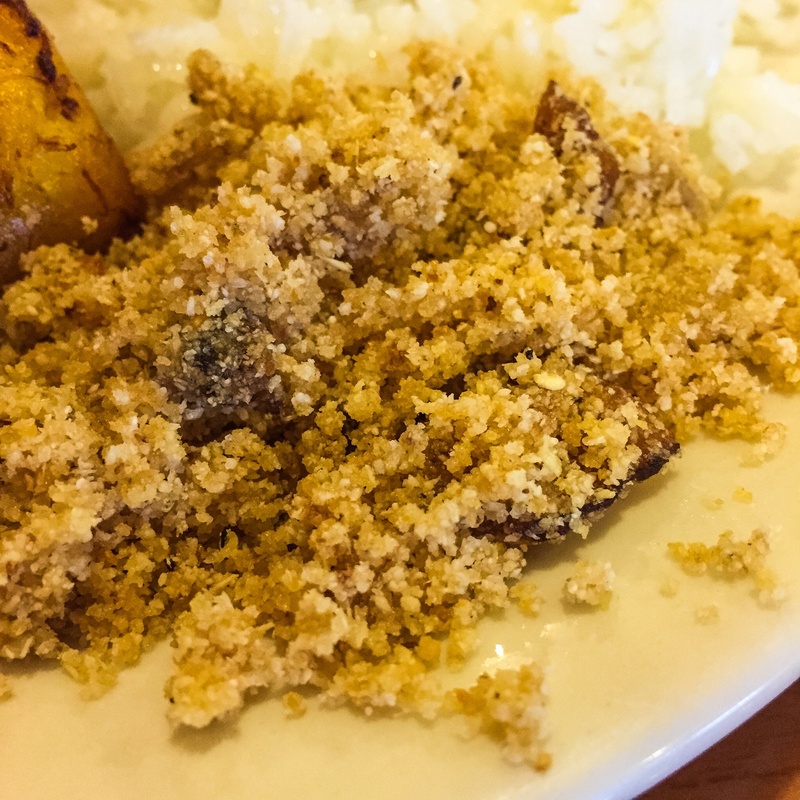 Manioc is also known as the main starch behind tapioca. As strange as it may sound, I have my Portuguese upbringing to thank for my love of Brazilian food. You’ll be hard pressed to find someone from Portugal who doesn’t love a good churrasco from their ‘little brothers’ in South America. 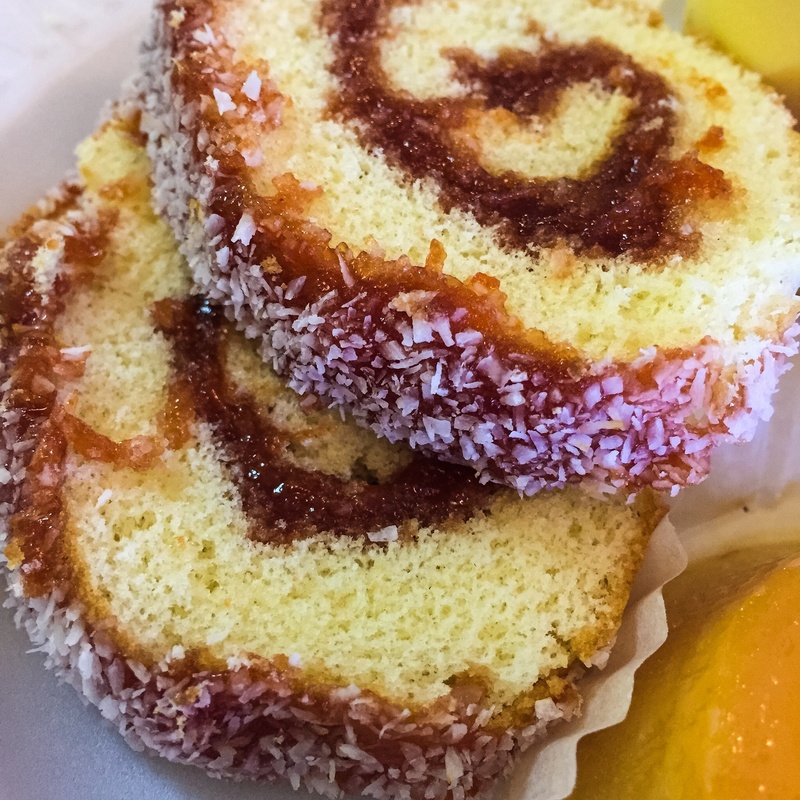 Most Brazilian baked goods are very similar to their European counterparts, but with more tropical fruits. 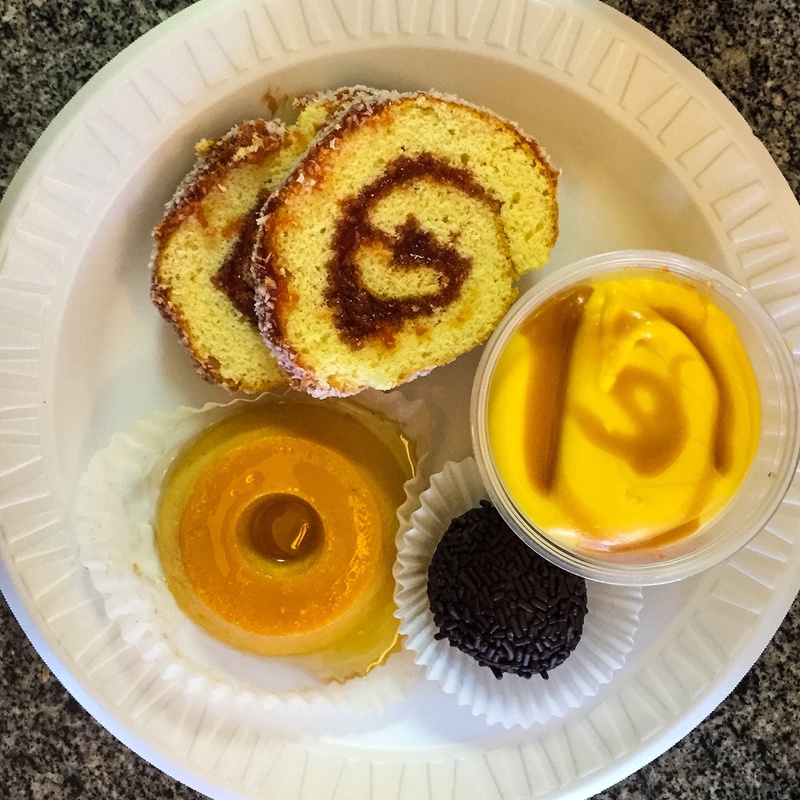 Since there are almost no Portuguese restaurants or bakeries in Georgia, I have to kill my culinary nostalgias (or saudades) in ‘Little Brazil’. 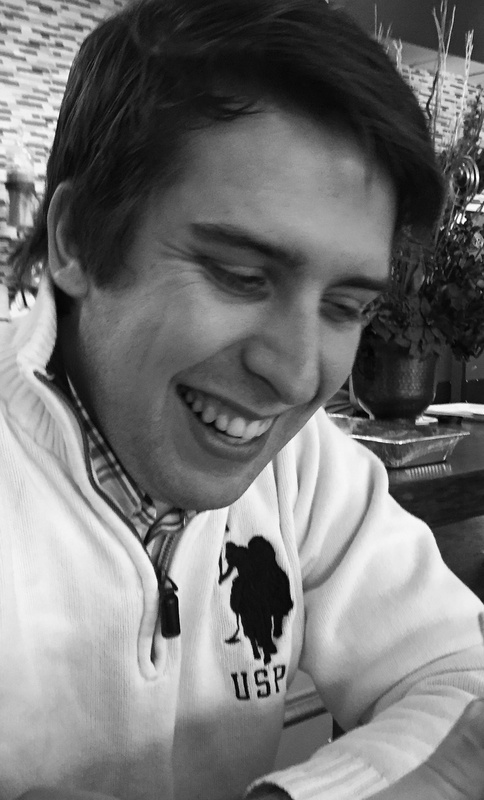 Though I feel like I stand out with my different nationality, I feel right at home speaking Portuguese with the staff and other patrons. They’re always very kind and happy to serve me, and I will forever associate their cheery personalities with their flavorful cuisine.